Smead End Tab Manila Expansion Folders w/Reinforced Tab, 2 Fasteners, Legal, 50/BX - Heavyweight folders have a W-shaped fold that expands to hold up to 1-1/2 of paperwork. Keep rough drafts of large documents fastened on one side of the folder and final drafts fastened on the other. Two-ply tab is 7/8" wide. Straight-cut tab is embossed for label placement. 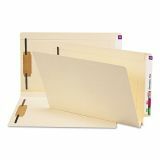 Each folder features two 2" prong B-style fasteners in positions No. 1 and 3 and reinforced top edge of back panel. Top corners in front and back are rounded. Folders are made of 14 point stock.